edited by John Hinks & Catherine Armstrong. New Castle: Oak Knoll Press; & London: British Library, 2008. ISBN (British Library 978-0-7123-5064-8, 265pp, £25, hardback. 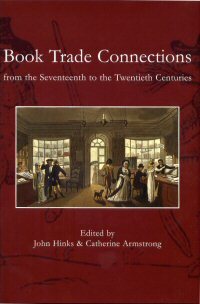 The twelve chapters of this book reproduce the papers presented at the 22nd Print Networks Conference on the History of the British Book Trade, University of Birmingham, July 2005. It is of particular relevance to users of this website because of two papers on folk play chapbooks by Eddie Cass and by Paul Smith. I will go into more detail about these shortly. However, there are other papers that may also be of interest, especially where they set the chapbooks in context. I will start with the more relevant of these. The core of Angela McShane's "Typography Matters: Branding Ballads and Gelding Curates in Stuart England" is that broadside publishers tended to use "white letter" (i.e. Roman) fonts when they wished to target a more educated and radical clientele, while using "black letter" (i.e. Gothic) fonts for more staid customers. She also demonstrates that it was common for series of broadsides on the same theme by different publishers to allude to and/or paraphrase each other. This may be something to be borne in mind when looking at folk play chapbooks. There is only one woodcut in the "Alexander" chapbook ascribed to J.White (if one excludes the royal coat of arms), and that is primitive in style - a far cry from Bewick's famous artistry. Gardner's observation therefore supports the view that this chapbook was one of White's earlier productions, or a cheap production, or both. The papers by Paul Smith and Eddie Cass are related, stemming as they do from the same project. Paul Smith, in his paper "The Chapbook Mummers Play: Analysing Ephemeral Print Traditions" gives an overview of the chapbook project he started at the University of Sheffield with Mike Preston and Georgina Boyes nearly forty years ago in 1972. The stated aims were to identify the main textual groupings of chapbook folk plays, and to determine the textual relationships within and between the groups. However, these aims were extended to locating and cataloguing all surviving copies of the chapbooks. The results have been an "Interim Checklist of Chapbooks" published in 1976, detailed monographs on the "Alexander and the King of Egypt" (1977) and "Christmas Rhyme" (1998) chapbooks - parts I and II of a planned series - plus a number of articles. Smith outlines some of the difficulties of studying chapbooks. Most are not dated, although they do normally bear the names of the printer or publisher, and often their business address. Scholars have had to use a variety means to date the chapbooks, notably using information from annual trade directories about the businesses and their premises, historical data on the typefaces and ornaments used for printing, and occasional dated references in antiquarians' records (but not, so far, historical evidence from paper watermarks). The outcome is usually a range of potential dates spanning anywhere from a couple of years to a few decades. Smith illustrates these difficulties with the "Peace Egg" chapbook published by J.Johnson of Leeds. Alex Helm (1969) had dated this to the period between 1813 and 1851. On re-examining the evidence of the imprint in more detail, Smith has been able to reassign this edition to the period 1872 to 1874, an important difference that has not been reported elsewhere. He also describes the methods used to record textual variations, as well as similarities and differences in the design and positioning of woodcut illustrations and other material. These can help determine the chronological sequence in which the various versions and editions were published. Unfortunately, Smith's paper is let down by its illustrations. Some of the figure references, illustrations and captions have become jumbled up. For example, the comparative table shown in fig.9 should really be in fig.7, and the facsimile pages shown in figs.7 and 8 should be moved to figs.8 and 9 respectively. While it is fairly obvious that something is awry, the chapbook novice may not be able to untangle the muddle correctly. It was not until I compared the illustrations with figures in Smith's other publications that I felt confident about what was meant to go where. The publishers really ought to produce a corrigenda slip to rectify these mistakes. Folk play researchers have been eagerly awaiting further volumes in the chapbook series, in particular Part III: "The Peace Egg", which is the largest group of folk play chapbooks, and has a well-documented relationship with traditional performance. It has been cited as "forthcoming" for decades (e.g. Preston et al, 1976a), and although Smith informs us that "Some five years was spent on compiling contextual and biographical information about each of 'The Peace Egg' chapbook printers, publishers, etc." (p.195), this volume has not yet appeared. Why? One complicating factor was the discovery in 2000 of Carr's "The Peace Egg Book", a veritable "missing link" between the Irish "Christmas Rhyme" chapbooks (from which it took its text) and the already familiar "Peace Egg" chapbooks. This necessitated a major reassessment of the body of evidence, but even allowing for this, publication seems well overdue. It is in the nature of such compilations that as soon as they are published, someone will discover a new edition (as with "The Peace Egg Book"), or more likely, a new snippet of biographical information that affects dates. I therefore humbly suggest that the project should publish their "Peace Egg" monograph as soon as possible, rather than delay longer for illusory perfection. It would probably be used more and stimulate more research if it left a few questions unresolved. Eddie Cass goes some way to assuaging our frustration in his paper entitled "The Printing History of the Peace Egg Chapbooks". Cass is a social historian who is relatively new to folk drama research, and who has a particular interest in Pace Egging plays. He is also a passionate bibliophile, so it is only natural that he should have thrown his lot in with the research of Smith and Preston on the "Peace Egg" chapbooks. In this paper, Cass reproduces some passages word for word from the chapbooks chapter of his book "The Lancashire Pace-Egg Play" (2001). However, this is forgivable because he adds significant new information from Lancashire, and extends his analysis to include chapbooks published in Yorkshire (although unfortunately not the "Peace Egg" chapbooks published in Glasgow - for which see Preston et al, 1976b). As already mentioned, "The Peace Egg" is the by far the largest group of folk play chapbooks, although this was not its original title. It seems likely that chapbooks with the earliest versions of this text first appeared in Yorkshire under titles such as J.Pearce's "The Mummers' Act; or, Morris Dancers' Annual Play of St. George", intended for performance at Christmas. These had different opening and closing speeches compared to later editions, but even the earliest classic text published by Henry Wardman of Bradford bore the title "The Mummer: or, The Wassail Cup". The title "The Peace Egg" seems to have been introduced in Manchester in the early 1840s. Speaking parenthetically, this title is rather odd, as it has no obvious link with either the text or plot of the play. Pace Egging, the Easter custom, naturally comes to mind, so the title may have been introduced to target this market, although Christmas is still referred to in the text. This conundrum is not addressed by either Cass or Smith. Cass does a creditable job of determining the genealogy of the various "Peace Egg" editions in Lancashire and Yorkshire, and of their forebears, mostly by painstakingly tracing the propagation of typographical transpositions and similar formatting quirks, and by tracking the re-use of woodcuts. This is where Cass's paper could have benefited from having illustrations. I would also like to have liked to have seen an updated version of his draft "Peace Egg" chapbook family tree (reproduced in Preston, 2003, p.172). Cass encounters a recurring difficulty, however, in that there are pairs of editions where one is evidently a copy of the other, but where there is insufficient evidence to say which version came first. The following papers are not relevant to folk drama, but may nonetheless be of interest. John Feathers', in "'Others': Some Reflections on Book Trade History", points out that the British and Irish book trade was largely concentrated in London. His paper usefully alerts us to the trade elsewhere, not just outside of London, but also outside of the mainstream - i.e. dissident works, sexually explicit material, etc. - which yield interesting insights into the society within which the trade operated. In "Newspapers and their Publishers during the Popish Plot and Exclusion Crisis", Susannah Randall shows how the volume of newspapers printed in the late 17th century responded to emerging political crises, as well as to waxing and waning legal constraints on publishing. The publishers themselves were often partisan and politically active, with wives and families keeping businesses running while the proprietors were in prison. "Young Boswell and the London Stationers" by James Caudle basically shows that the relationship between James Boswell and his printers and booksellers was social as well as business related. Stephen W.Brown's paper "Indians, Politicians and Profit: the Printing Career of Peter Williamson" is a very entertaining read, not least because Williamson was such a colourful character who had a very adventurous life. The paper focuses on Williams's foray into the journal trade, mostly in Edinburgh. He certainly seems to have had the knack of rubbing people up the wrong way, not that his competitors were exactly welcoming, and it all ended badly for him. Johanna Archbold in "Periodical Reactions: The Effect of the 1798 Rebellion and the Act of Union on the Irish Monthly Periodical" reminds us that the Rebellion was largely fomented by Irish Protestants. The government used various methods to suppress Irish newspapers, which led to an increase in the political content of the otherwise neutral monthlies. There were major changes in the press after the Rebellion, but more so after the Act of Union, when politicians and much of the Irish intelligentsia decamped from Dublin to London. Frank Felsenstein's "What Middletown Read" seems out of place in this collection, in that it relates to library history in the United States of America rather than publishing in Britain and Ireland. On its own terms, it marks the start of a project to investigate a cache of 19th-century library records from Muncie, Indiana, although at this stage it presents a host of interesting questions rather than answers. "Welsh Obscurity to Notoriety" by Lisa Peters describes how Lloyd George's anti-Boer War views were reported in the opposing Conservative and Liberal north Wales newspapers, and how this may have affected local views and his fortunes at the polls. The career of romantic author Marguerite Jervis is explored in Elaine Jackson's "Sievier's Monthly (1909): Pseudonyms and Readership in Early Twentieth Century Popular Fiction". Jervis wrote successfully under a number of pseudonyms, partly to overcome prejudice against female authors, but also to permit higher output. It provides useful insights into why people use pseudonyms and the nature of the real authors. This applies equally to folklore contributors to newspapers and magazines as to fiction writers. This book will be of interest to anyone who would like to know about the printing and book trade during folk drama's formative years, and its influence on popular culture. It will be valuable to serious folk play researchers, particularly while we await the long-heralded treatise on "The Peace Egg" chapbooks. For lateral thinkers, there are some interesting tangents that would be well worth following. Postscript: The British Library Publishing catalogue that came with the review copy is a pleasure in its own right. It is packed full of beautiful books about books and the British Library's exhibitions, with something to suit the tastes of all discerning readers. Also, if you are ever in London near St.Pancras with an hour or two to spare, it is always worth going into the Library to check out the book shop, or to view the exhibitions, which are free of charge.